Editor's note: There is one image associated with this press release. Eros Resources Corp. ("Eros") (TSX VENURE:ERC) is pleased to announce the discovery of a new zone of uranium mineralization on its Murphy Lake joint venture property in the shallow eastern portion of the Athabasca Basin of Saskatchewan, which is held in its wholly owned subsidiary Anthem Resources Incorporated. 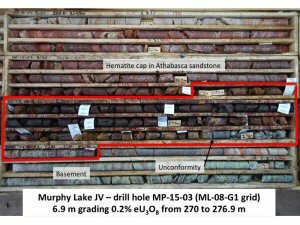 Denison Mines Corp., the operator of the joint venture, reports that drill hole MP-15-03 intersected 0.2% eU3O8 over 6.9 metres (270.0-276.9 m) at the sub-Athabasca unconformity. (eU3O8 is radiometric equivalent uranium from a total gamma down-hole probe). Hole ML-15-03 was the first drill hole of a four-hole program and represents a brand new discovery. The mineralization is associated with a zone of strong sandstone alteration including desilicification and clay over a hematite cap. Basement rocks immediately below the mineralization consist of graphitic pelitic gneisses cut by faults. The target was an east-west oriented resistivity low anomaly that has been tested by only one other drill hole previously. That drill hole is located 400 metres to the east and was flagged for follow-up due to significant sandstone alteration above graphitic basement rocks. A photo of the mineralized drill core has been posted to the Eros website at www.erosresourcescorp.com. Three additional drill holes have been completed to follow up on the mineralization in MP-15-03. While none of the holes intersected mineralization, alteration and structure suggest a highly prospective system, which is open to the west and likely to the east. The summer drilling for 2015 is complete and follow up drilling is being planned for January, 2016. Murphy Lake property is located approximately 30 kilometres northwest of the McClean Lake mill. Eros currently holds a 41.06% interest the Murphy Lake JV with Denison holding the balance. Anthem elected not to contribute to the 2015 program, and therefore will be diluted to an approximate 32% interest. Boss Power Corp., effective July 29, 2015, changed its name to "Eros Resources Corp." and is trading on the TSX Venture Exchange under the stock symbol "ERC". 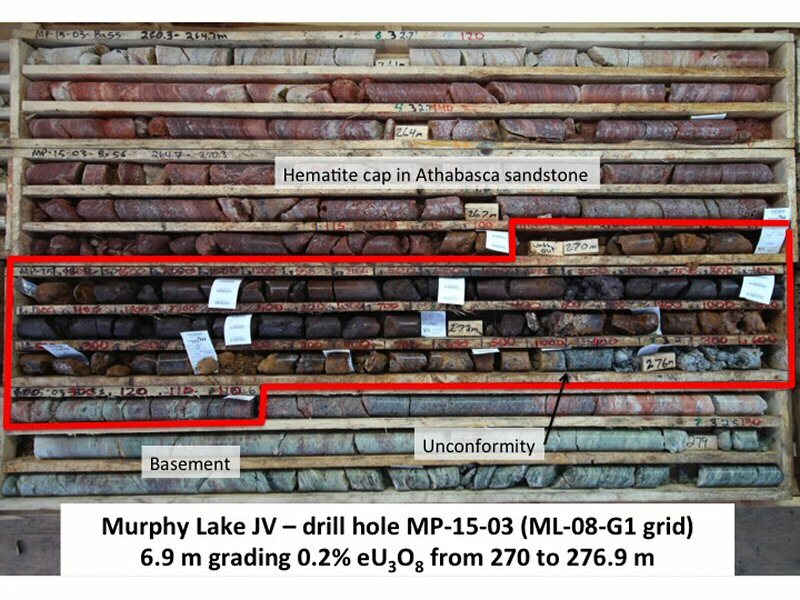 Eros, the combined company, will review its approach to the very prospective shallow Athabasca uranium play regarding the significant position in both Murphy Lake and Hatchet Lake. The technical information in this release has been reviewed by Michael S. Cathro, M.Sc., P.Geo., a qualified person under NI 43-101 and a consultant to the Company. For a description of the quality assurance program and quality control measures applied by Denison, please see Denison's annual information form dated March 5, 2015, filed under the company's profile on SEDAR. Eros Resource Corp. is a well-financed Canadian public company focused on the exploration and development of mineral deposits in North America. About this company Eros Resources Corp.